Q: Will the shop be closing? And when? A: Yes, over a 17 day period beginning on 5 June (last day of trading Sat June 3) and ending when we re-open on Thursday 22 June 2017, the shop will be temporarily closed for the final refurbishment to be completed. Q: What if I need some work doing on my bike whilst you are closed? A: We are going to keep our basement workshop open during the entire refurbishment period, so if you need some work doing on your bike, we can still help. However, work will only be accepted on a pre-booked basis. Please call us on 01422 361 460 to book your bike in with us and to arrange dropping it off. Q: What will happen to your other services, like the workshop and bike-fit? A: These will continue after the refurbishment. We will offer all the main services, including bike repair and servicing. Q: I bought a Specialized bike from you recently. Will you still providing servicing and warranty support for this bike? A: Yes, we will be providing servicing and repair for all brands (not just Giant and Liv). And all warranties will be honoured as before the refurbishment. Q: Will we see new staff in the new store? A: The good news is that there are no staffing changes – only the look of the shop and the brands of products will change. Q: Will I still be able to bring my Mavic wheels in to be serviced/repaired? A: Yes, we will continue to repair and service all brands of bikes. This entry was posted in Latest News on April 24, 2017 by pedalsportclub. The new Toughroad from Giant is hard to define using traditional bike categories. It’s essentially a fully rigid mountain bike with lots of carrying points/potential. It’s unofficially an “Adventure bike” aimed at the outdoor folk who will be in the Lake District one weekend, on a city break the next and tootling across a beach the next. It can handle mountain bike terrain but also a long road-based touring style adventure. Whatever the category, it’s a great all-rounder with the capacity to handle almost any form of riding. This entry was posted in Latest News on April 4, 2017 by pedalsportclub. 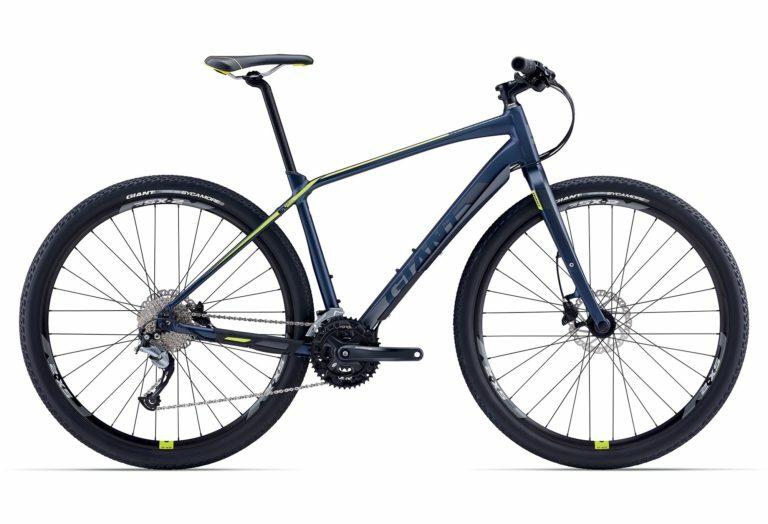 The all new Fathom 2 from Giant blends the efficient ride quality of a classic hardtail with the can-do capabilities of an all-around trail bike. It’s built around a lightweight ALUXX SL aluminium frame that’s designed specifically for 27.5 wheels. 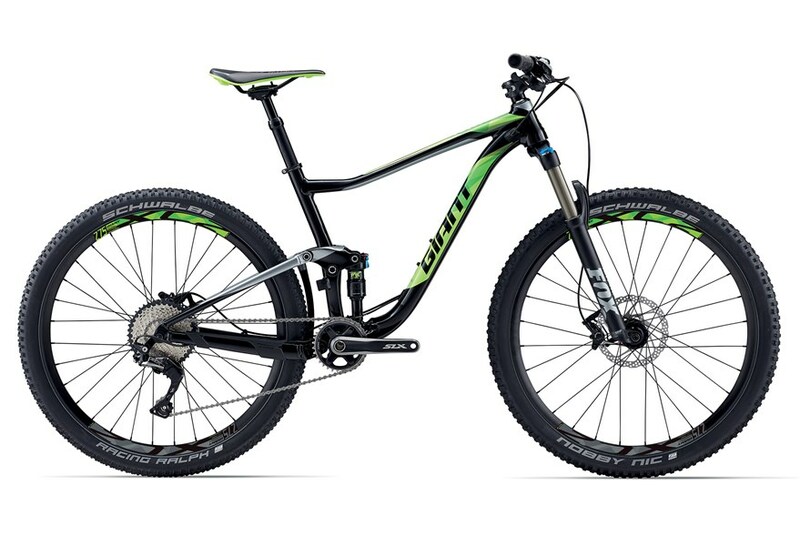 The frame features more forgiving geometry, including a 67-degree head angle designed for a 120mm suspension fork – so it’s well-suited to modern mountain bike trails and trail centres. The Fathom series also offers a rugged component selection, giving aspiring trail riders the ability to climb technical terrain with less effort and have more fun on the descents. The quick and agile Anthem 2 fast trail bike is updated this year with a new Trunnion Mount Maestro rear suspension system for even smoother trail performance. The new Advanced Forged composite rocker arm adds strength, giving you 110mm of smooth, active rear travel. The lightweight ALUXX SL aluminium frame is engineered specifically for 27.5 wheels and a 120mm suspension fork. New this year is Boost hub spacing (110 front/148 rear), which improves wheel stiffness for added control, while adding tyre clearance and improving drivetrain performance. 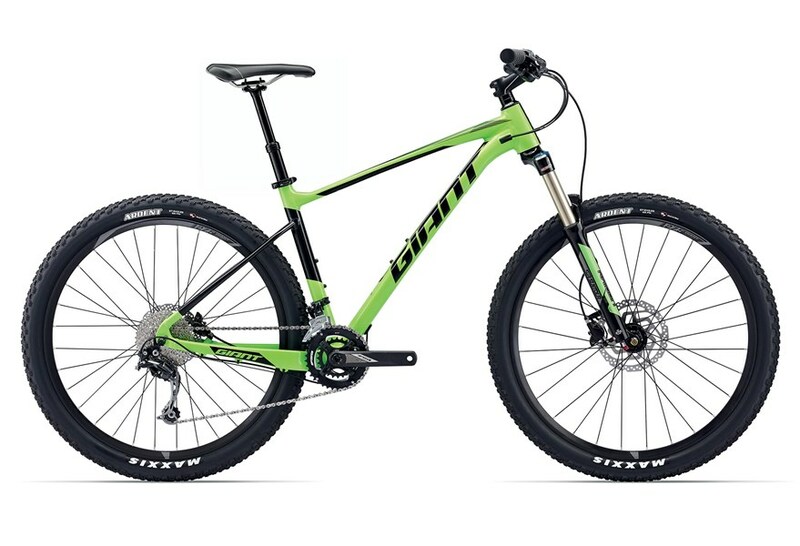 The frame also features Giant’s OverDrive steerer tube for razor-sharp handling, plus a PowerCore bottom bracket for maximum pedalling stiffness and power transfer. 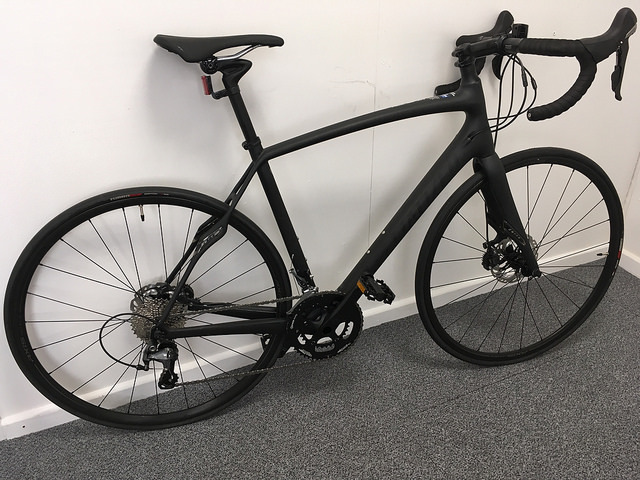 This is one of the most striking bikes we have in stock at the moment and it is also an opportunity to pick up a very high specification bike at £900 off the RRP. 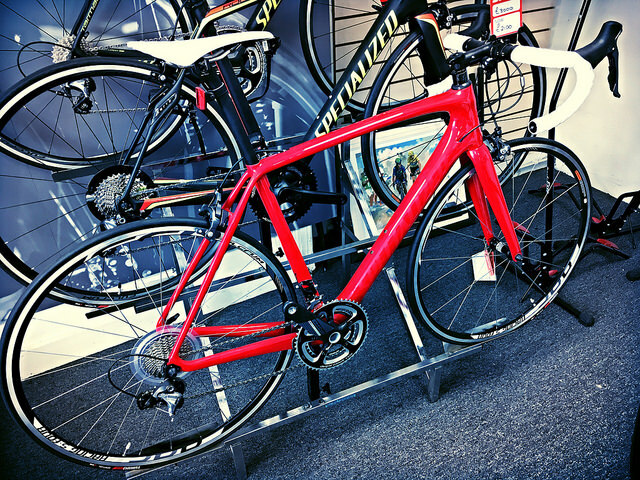 This Specialized Tarmac Expert is a 56cm 2015 model, but is absolutely brand new. The RRP was £3000, but we are selling it at £2100. Pop into our showroom today for a full appreciation of what a beautiful bike this is. Meet the Giant TCR Advanced Disc. 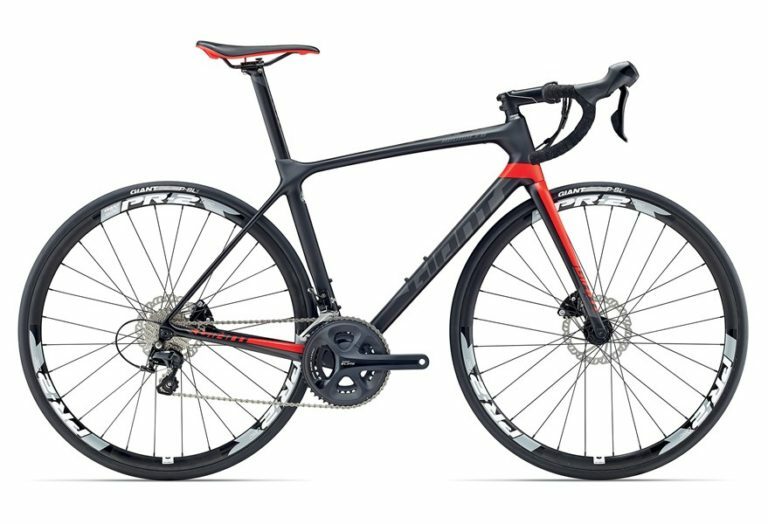 Designed with Compact Road geometry and constructed with Advanced-grade composite, TCR Advanced delivers class-leading efficiency. The Variant seatpost blends efficiency and compliance for a race-tuned ride quality so you can hammer out more miles. With all-new disc brake integration, including 12mm front and rear thru-axles, it’s a performance road machine for any weather and all types of conditions.